Ever since the Promised Messiah (on whom be peace) made his claim and established his Jama’at and up until today Muslims have continuously alleged against the Promised Messiah (on whom be peace) and his followers that we deny the concept of finality of Prophethood because the Promised Messiah called himself a Prophet or because we accept him as a Prophet. It is of course a completely fabricated allegation. In accordance with the teaching of the Promised Messiah (on whom be peace) we are more convinced of the finality of Prophethood of the Holy Prophet (peace and blessings of Allah be on him) and demonstrate it more and our hearts are more filled with love for the Holy Prophet (peace and blessings of Allah be on him) and we spread his faith more than other Muslim sects. In fact they have not understood the status of the Holy Prophet (peace and blessings of Allah be on him) even a fraction as compared to how Ahmadis have in light of the teachings of the Promised Messiah (on whom be peace). They have always opposed Ahmadis on the basis of finality of Prophethood. Time and again something causes an upsurge in this and so-called religious leaders and organisations try and provoke Muslims. In order to save their skin following the recent martyrdom of an Ahmadi in Glasgow our opponents have tried to make it an issue of religious sentiments. However, due to the very positive stance of the Government on the matter and the intense interest shown by media, Muslim organisations, in fact the biggest Muslim organisation here, tried to adopt an apparently sympathetic position. Still, most obdurately they maintained that regardless of everything Ahmadi are not Muslims. This point is widely expressed in their mosques and is so ingrained in the general Muslim populace that Muslim children who probably do not even properly remember the Kalima and have no idea what finality of Prophethood is, tell Ahmadi children in schools that they are not Muslim. Some girls and boys recently wrote letters to Hazrat Khalifatul Masih about this treatment. Huzoor said, I say to them to learn about Islam more than ever and tell your friends that you are Muslim and you practice teachings of Islam. 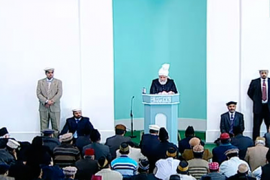 We accept the Holy Prophet (peace and blessings of Allah be on him) as the Seal of the Prophets and in light of his prophecy we accept the Promised Messiah as his servant and subordinate Prophet. This upsurge of hostility against Ahmadis rises in different countries time and again and because of media and ease of travel the enmity reaches everywhere. Thus no country in the world is safe from the so-called Muslims who spread disorder and chaos. They reach everywhere, including Africa. Ahmadis built mosques in Africa, so they reached there to pronounce that Ahmadis are not Muslims! Those who live here, in Europe give the same teaching in their mosques and madrassas and are thus filling their children’s minds with venom. In order to counter them wherever they reach, it is the duty of our Ahmadi youth to be well-versed in the true teachings of Islam which the Promised Messiah (on whom be peace) has elucidated to us in this age. Which is that the Holy Prophet (peace and blessings of Allah be on him) was the last law-bearing Prophet and in terms of religious law (Shariah) Prophethood was finalised in his person. Likewise, the Holy Qur’an is the last law-bearing Book and the Promised Messiah has come in the subordination of the Holy Prophet (peace and blessings of Allah be on him) and as such is a subordinate Prophet who has come to continue and spread the Shariah of the Holy Prophet (peace and blessings of Allah be on him) in the world. We have always observed what God’s treatment has been thus that when these oppositions surge, they work as a means of growth and development for us. In light of the current opposition and media’s reporting on it, the Jama’at has received huge coverage which probably would not have been possible to achieve in such a short period. It garnered a lot of attention as well as informed those Ahmadi youth who were not so interested in religion and only joined in on rare occasions that we accept the Promised Messiah was a Prophet but only in subordination of the Holy Prophet (peace and blessings of Allah be on him). ‘Our objective, for which God Almighty has made our heart fervent is that only the Prophethood of the Holy Prophet (peace and blessings of Allah be on him) be established which has been established by God Almighty for always and ever more and all false prophethoods, which they have set up through people’s innovation, are crushed to smithereens. Observe all these religious enthronements and witness for yourself if we have accepted the finality of Prophethood of the Holy Prophet (peace and blessings of Allah be on him) or they have? It is unfair and mischievous to consider that God Almighty only willed this much regarding finality of Prophethood that one should verbally accept the concept of finality of Prophethood but carry on doing whatever one wanted to do. And make new religious law of one’s own. Just as they have invented Baghdadi Salat and Ma’akoos Salat etc. Do we find any indication towards it in the Holy Qur’an or the practice of the Holy Prophet (peace and blessings of Allah be on him)? Similarly, is there any proof in the Holy Qur’an that the name of Sheikh Abdul Qadir Gilanai should be incanted and invoked! Sheikh Abdul Qadir Jilani was not even around at the time of the Holy Prophet (peace and blessings of Allah be on him). Who taught this incantation then? Have some shame. Is this what constitutes abiding by Islamic Shariah? Judge for yourself if after having such creed and such practices are you in a position to allege against me that I broke the hallmark of the Seal of the Prophets? The truth of the matter is that had you not let innovations enter your mosques and had you accepted the true Prophethood of the Seal of the Prophets (peace and blessings of Allah be on him) and made his practice and his ways your guiding light there would have been no need for me to come! It were your innovations and new prophethoods that stirred the sense of honour of Allah the Exalted to send a person in the mantle of the Holy Prophet (peace and blessings of Allah be on him) to demolish the idols of these false prophethoods. God appointed me for this task and sent me. I have heard that a certain incantation is done at the place of Ghous Ali Panipati. As for prostrating before these people who are religiously enthroned or circumnavigating their homes, well those are very common and minor matters. The Promised Messiah (on whom be peace) said: ‘I also say that those who come from God do not say anything bad, they only ask to worship God, be kind to creation and offer Salat. They remove the wrongs that find their way in religion. Thus I have also been sent for the reformation of the wrongs that have developed…The biggest wrong is that the greatness of Allah the Exalted has been dragged in dust and the true, important and excellent teaching of the Holy Prophet (peace and blessings of Allah be on him) on Unity of God has been made doubtful. On the one hand are Christians who say that Jesus is alive and your Prophet (peace and blessings of Allah be on him) is not alive and they call Hazrat Isa god and son of God since he has been alive for two thousand years and time has had no effect on him. On the other hand Muslims have acknowledged that certainly Jesus was raised alive to the heavens and remains in the same condition for the past two thousand years. There has been no change or alteration in his condition while the Holy Prophet (peace and blessings of Allah be on him) has died. I say truly that my heart trembles when I hear a Muslim maulawi say that the Holy Prophet (peace and blessings of Allah be on him) has died. A living Prophet has been declared dead. There could not be worse disgrace and dishonour of Islam! Yet this wrong is of the making of Muslims themselves who have made something up completely against the Holy Qur’an. The Holy Qur’an mentions death of Jesus most clearly. However, the rectification of this wrong was to be performed by me because God has called me Hakm (arbiter) who was to come and remove this wrong. The world did not accepted him but God will accept him and will establish his truth with powerful assaults. Matters like these have harmed the world a great deal. Illustrating that the Promised Messiah’s (on whom be peace) devotion to prove the high status of the Holy Prophet (peace and blessings of Allah be on him) was not limited to intellectual exercise but his practices also demonstrated the teachings of Islam, below are some accounts from his blessed life. During his stay the Promised Messiah (on whom be peace) encouraged Abdul Haq to ask as many questions and as frequently as he needed to. Editor of Al Badr writes in a note: Good-natured people should reflect on the affection and compassion of the Promised Messiah (on whom be peace) and imagine the passion he felt to save a soul. Was walking with him as he saw him off for three miles not merely borne of compassion? What else did he have to do with Mian Sirah ud Din? Had one’s nature been good one could find the truth merely by this display of compassion. God’s salutations be on you, who had such passion for us…. The Promised Messiah (on whom be peace) said: ‘He understood [my] perspiration to be an indication as if there was nothing in this. Alas! You should have asked him why he offered Salat during his stay here. And did he not say that he was satisfied! If he were here in front of me I would ask him on oath. When face to face one is embarrassed [not to lie]. Man has been sent for a very important task but when it is time he does not fulfil the task. And God deals with him. Take the case of home help, if they do not work properly they are dismissed. Why would God Almighty keep someone who does not fulfil his obligation! These are just a few extracts from the huge treasure-trove that the Promised Messiah (on whom be peace) has given us and we see that he fulfilled the dues of adopting and implementing the teachings of the Holy Prophet (peace and blessings of Allah be on him) and the Holy Qur’an. He did not simply raise a slogan of finality of Prophethood, in fact his each word and deed was in subordination of his master. He instructed and advised his followers to also abide by this teaching. May God enable us to fulfil the dues of being included in the Promised Messiah’s Jama’at and enable us to put the teaching in practice and may God give us rightful insight into the high status of the Holy Prophet (peace and blessings of Allah be on him) and may we present Islam’s true picture to the world!